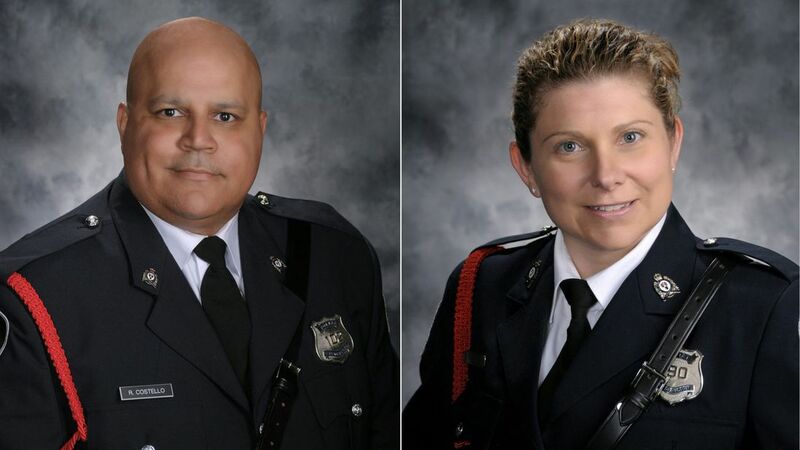 A man has been charged with the murders of two police officers and two others in a shooting in Canada. Matthew Vincent Raymond, 48, was arrested and charged with four counts of murder after the fatal shootings of Constables Robb Costello, 45, and Sara Burns, 43, and Donnie Robichaud and Bobbie Lee Wright. Raymond was charged after the four victims were killed in Fredericton, the capital of province New Brunswick, on Friday at 7.10am (12.20pm UK time). He is the only person being treated for injuries related to the shooting. Police officers have not disclosed his motive. In tribute to their colleagues, Fredericton police said: "Our deepest condolences to the families of our fallen members 45-year-old Lawrence Robert Costello and 43-year-old Sara Mae Helen Burns and the other victims in this morning's shootings. "As the sun sets on today, we want to thank everybody for the amazing outpouring of love and support today. We feel it. "As we grieve for our colleagues and the other victims, we know you are grieving with us. Make sure to look after one another. And if you are having a difficult time, make sure you reach out and talk to someone. You are not alone." The city's mayor, Mike O'Brien, said: "Not enough can be said about the courageous efforts shown today, and everyday, by members of the Fredericton Police Force, the first responders involved, and all those who respond to the call for help." The Prime Minister, Justin Trudeau, said in a statement: "Canadians across the country were shocked to wake up to news of the shooting in Fredericton that left four people dead, including two police officers. We mourn with everyone who has lost a friend, colleague, or family member, and wish those injured a speedy and full recovery. "There is no greater gesture than to put oneself in harm's way to protect the life of another. This morning, first responders rushed to the scene of danger. They did not think twice about what they had to do to keep their fellow Canadians safe. They were unflinching in their duty. We will not forget the two fallen police officers whose sacrifice no doubt saved lives and prevented even greater tragedy. "The people of Fredericton are courageous, strong, and resilient. Canadians stand with you during this difficult time."